John Radcliffe Hospital, Oxford OX3 9DU, UK. 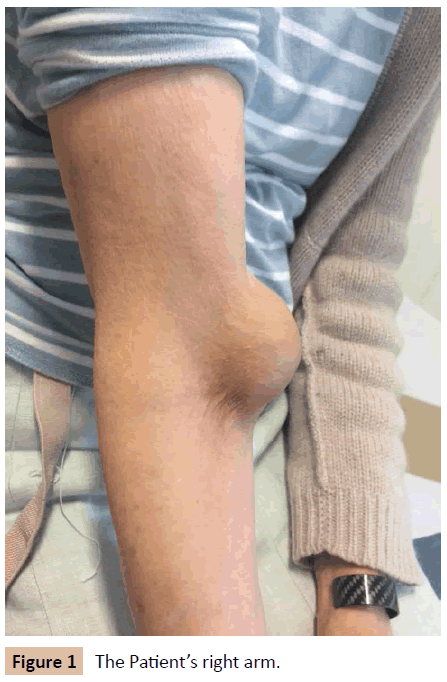 We report a case of a patient who presented with an eight week history of a painful arm swelling, which initially occurred after insertion of a peripheral venous cannula. She had a history of atrial fibrillation for which she was anticoagulated with apixaban. On examination she had a pulsatile swelling, and Duplex ultrasound confirmed a brachial artery pseudoaneurysm. She underwent successful surgical repair. This is a known, albeit rare, potential complication of peripheral venous cannulation and was complicated in this instance by anticoagulation. We believe that this case highlights that even procedures as routine as cannulation are potentially dangerous. A good knowledge of local anatomy is essential to avoid complications such as this. In this case, the patient had to endure significant pain and uncertainty, followed by an operation and inpatient stay. If the pseudoaneurysm had ruptured it could have been catastrophic, particularly due to her anticoagulation. The main lesson of this case is to remember that cannula insertion is not entirely benign. Considering anatomy and ensuring the patient is appropriately consented are vital to avoid further situations such as this. A 71 year old woman presented to ED with a painful arm swelling. This swelling had been present for 8 weeks but had doubled in size and become painful over the course of the preceding day. There were no systemic symptoms or skin changes. She had a recent inpatient stay (8 weeks prior) for a cardiac ablation procedure for atrial fibrillation (AF), which was complicated by cardiac tamponade, necessitating a longer stay in hospital. After discharge from hospital she noticed a painless swelling in her right arm which grew very slowly in size. She visited her GP and was reassured that this was likely a haematoma and would resolve. On direct questioning she reported that she had a cannula placed in her right antecubital fossa during her admission. Aside from a history of AF, she also reported spondylolisthesis and recurrent chest infections. Her AF was treated with flecainide and she was anticoagulated with apixaban. She is very active and independent, and found that this swelling on her arm was interfering with her daily activities. On examination she had a 3 x 3 cm swelling on the medial side of her upper arm, just above the medial epicondyle. This was pulsatile, non-mobile, and was painful on flexing or extending the arm. A clinical diagnosis of a brachial pseudoaneurysm was made. A Duplex ultrasound confirmed a 3 x 3 cm pseudoaneurysm arising from the right brachial artery. The distal artery was patent. This pseudoaneurysm was thought to be due to an accidental puncture of the brachial artery when a cannula was being inserted during her recent inpatient admission, complicated by anticoagulation. The majority of iatrogenic pseudoaneurysms are in the groin, secondary to percutaneous interventions, but management options are the same for any location. 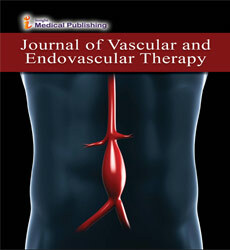 These options are compression under ultrasound guidance, injection of thrombin, coil embolization or surgical repair . Compression alone does not have as good success rates as thrombin injection and is time-consuming and uncomfortable for the patient . In lower extremity pseudoanerysm the success rate post thrombin injection has been reported at 96-100% [2,3] and it is recommended by the National Institute for Health and Clinical Excellence as first line treatment . Initially an attempt was made at thrombin injection in this case. A Duplex showed that the aneurysm was successfully thrombosed and there was no filling seen post procedure, however on followup ultrasound one week later the pseudoaneurysm was once again patent. A potential reason for failure of thrombin injection is the large size of this pseudoaneurysm (37 mm AP diameter) and that the patient was fully anticoagulated. A lot of the literature has focused on injection into smaller pseudoaneurysms and so less is known about the efficacy of thrombin injection in larger size aneurysms. When the patient was reviewed she reported some pain in the right arm, and there was some compression of the distal radial artery by the pseudoaneurysm. Definitive management was proposed, in the form of surgical repair (Figure 1). This was initially delayed due to the patient developing a chest infection but was carried out successfully 3 weeks after initial presentation. The aneurysm sac was opened and a small defect in the arterial wall repaired. She recovered well after the operation and was discharged home the following day. Figure 1: The Patient’s right arm. This case raises an important point, which is that even the most routine of procedures is not as benign as we think. Pseudoaneurysm secondary to peripheral venous cannulation is not a new issue and was described in the literature as long ago as 1964  (Figure 2). Figure 2: Duplex ultrasound showing artery and pseudoaneurysm sac. Anatomy is taught during all undergraduate medical curricula and therefore all doctors inserting cannulas should be well aware of the proximity of the brachial artery to the veins in the antecubital fossa. However, the standard and extent of anatomy teaching can vary widely between different medical schools. A recent study found that although 85% of final year medical students feel that sound anatomical knowledge is vital for the Foundation Doctor, only 50% ranked their own competence as adequate . It is not only doctors who are responsible for cannulation. This is performed by a wide variety of staff including healthcare assistants, and their training is less regulated and less standardised. This is not to say that cannulation should only be performed by a doctor or registered nurse, rather that any cannulation training should include an overview of relevant local anatomy (Figures 3 and 4). 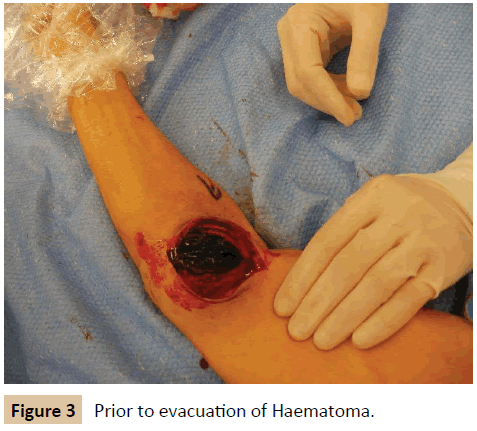 Figure 3: Prior to evacuation of Haematoma. 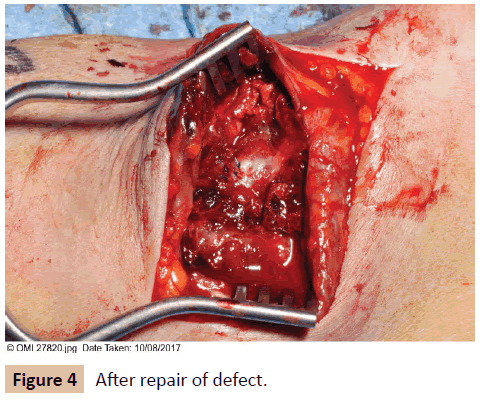 Figure 4: After repair of defect. Almost all inpatients will have at least one cannula inserted during their time in hospital and it is often left to junior members of the team to do this. Consent is usually verbal at most and is very rarely fully informed. The potential consequences of a poorly placed cannula can be enormous. In this case, the patient had to endure almost a month of pain and uncertainty, followed by an open operation and an inpatient admission. After it was diagnosed as a pseudoaneurysm she was very concerned that it could rupture and lead to extensive bleeding, which may well have been catastrophic due to her anticoagulation. By the time of operation the pseudoaneurysm had grown in size and was beginning to compress the distal artery although blood flow was preserved. Further consequences such as limb loss were also possible. Pseudoaneurysm is not the only potential complication of cannulation. Another recent case highlighted the importance of valid, informed consent after a patient developed lymphoedema after cannula insertion . In this case the patient actually refused consent for the cannula, adding another element to the interaction. The doctor was initially found not guilty of negligence but this was reversed on appeal, and he was found guilty. Although this is an extreme example it is important as the doctor felt he was following policy and acting in her best interests. The main lesson from this case is to remind all practitioners who might be inserting a cannula that this common procedure may have serious consequences. Although this is a rare complication it is a dangerous one. A good grasp of the local anatomy along with a sensible explanation of the procedure to the patient is essential to try and avoid situations such as this in the future. Hands L, Thompson M (2015) Oxford Specialist Handbook of Vascular Surgery. Oxford University Press. PP: 360. Khoury M, Rebecca A, Greene K, Rama K, Colaiuta E, et al. (2002) Duplex scanning-guided thrombin injection for the treatment of iatrogenic pseudoaneurysms. J Vasc Surg 35: 517-521. Weinmann EE, Chayen D, Kobzantzev ZV, Zaretsky M, Bass A (2002) Treatment of post catheterisation false aneurysms: ultrasound-guided compression vs ultrasound-guided thrombin injection. Eur J Vasc Endovasc Surg 23: 68-72. Thrombin injections for pseudoaneurysms (2004) National Institute for Health and Clinical Excellence. Interventional Procedures Guidance. Baird RJ, Doran ML (1964) The False Aneurysm. Can Med Assoc J 91: 281-284. A Ali, Z NKhan, W Konczalik, P Coughlin, SEl Sayed (2015) The perception of anatomy teaching among UK medical students. RCS Bulletin 97: 397-400. Wheeler R (2017) Consent for a cannula. RCS Bulletin 99: 281.